Here we have a few photographs that I took on Mahe in the Seychelles. This Island is a haven for some beautiful insects, Spiders, birds and reptiles. The terrain is mainly Jungle and is quite hard to get through in places. The Island is only small so there isn't to much chance of getting lost in fact if you keep on walking in any direction youwill inevitably end up back at the sea in under a few hours, less in my case because I walk fast. 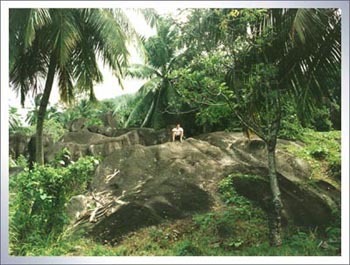 The terrain does make you feel quite small and if you go too far of the track there are some small mountainous areas that can be quite dangerous, these areas are home to the Seychelles kestrel and the Echo parakeets, and lower down the Pink pigeon which are endangered species. 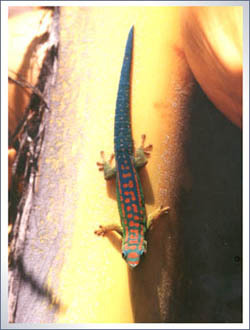 I spent many a day trekking through the jungles and took many photographs of the wildlife in there.The beautiful Gecko was captured quite by accident sunning itself on a coconut tree, and lucky forme I got quite close to it without disturbing it, I've seen many Gecko's on my travels but this as tobe one of the most beautiful I have seen. Any one who visits Mahe will be aware of not only the Fruit bats but the Giant Nephila spiders that seem to dominate the Island in there huge Orb webs, some of the webs I saw must have measured over two metres in diameter and had small birds entangled in them. 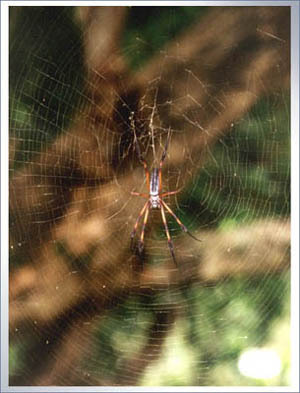 The Nephila spider is ( Nephila Madagascarensis ) and the females can have a leg span of over six inches.